Let me start by saying that I believe all goats should be disbudded at a very young age to avoid the eventual chore of having to remove the actual horns. This young goat did not get disbudded as a kid and needs to have his horns removed to avoid injury to others. 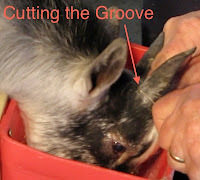 There is more than one way to remove a goat's horns. I favor using bands and not just cutting them off with a saw or a dehorning tool. Whatever method you use to complete the task it is important to secure the goat, a milk stand works great. When using elastrator bands (also used for castration) it is critical that you cut a groove in the horn for the band to stay put. A saw or file can be used but I much prefer the "wire saw". The groove does not have to surround the entire horn but should be ample to hold the band from not slipping off. 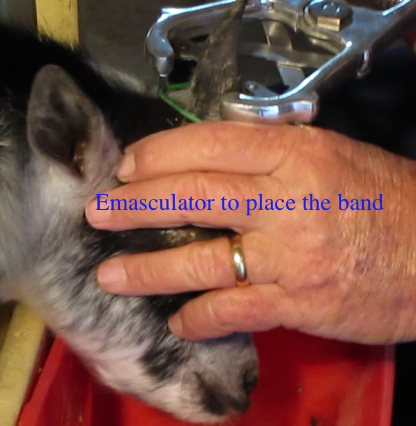 An emasculation tool makes the job much easier to get the band over the horn and down close to the groove you cut. Once the band is on the horn, it's easily rolled down to fit snug into the groove. The last step is to protect the band from being rubbed off by the goat. Using brightly colored tape will allow you check to see each day to insure that everything is still in place. If one of the bands gets knocked off just put another on and re-tape. 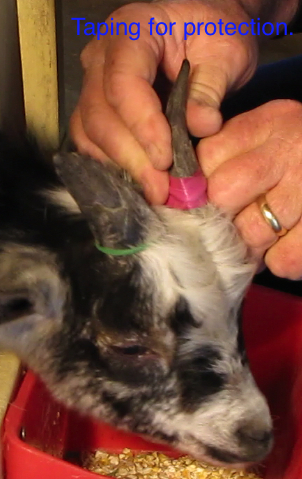 The band is cutting off the blood supply to the horn and will eventually cause the horns to fall off. As the horns begin to fall off, do not attempt to help, just let the process work. What do you do if there are scurs after doing this? We have a doeling where the horns fell off nicely but she then produced scurs. We did it again three months later and they fell off after a few days. Do we need to make sure more of the horn is removed?